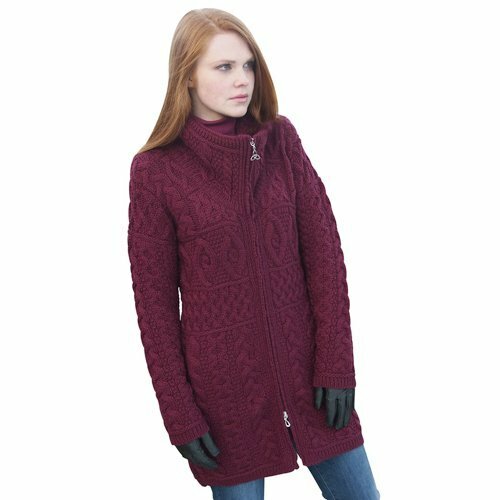 This Ladies Irish Merino High Collar Zipper Aran Sweater Coat by Westend Knitwear is a must have for any wardrobe. The Irish aran sweater shows off an array of traditional aran stitches creating a beautifully designed garment. Promising outstanding quality, stunning design and great comfort and warmth this authentic Irish sweater will stand the test of time and continue to keep you snug, stylish and fashionable all year round. Aran knitwear is forever rising in the fashion world with people all around the world wanting a piece of this authentic Irish clothing. This sweater was created by Westend Knitwear, A perfect gift for any occasion. Located in the village of Monasterevin in County Kildare, West End Knitwear was established by Molly Cullen in 1957. Molly's dream was to incorporate the family knitting business whose heritage stretched back for over 100 years. Molly is the granddaughter of Kate O'Shea, who, in 1856, was the first craftswoman in Ireland to commercially market her robust, hand knitted woolens. Molly's sons John and Paul along with her grandson Niall are the present owners of the company. Outstanding Quality & Design with this Aran Sweater - Aran knitwear is forever rising in the fashion world with people all around the world wanting a piece of this authentic Irish clothing. A Perfect gift for any occasion. If you have any questions about this product by Aran Crafts, contact us by completing and submitting the form below. If you are looking for a specif part number, please include it with your message.